Over the past few months, with all that's going on in the world, me and Suzi, like a lot of people, have sometimes been affected by things out of our control, we've sometimes struggled to see the light. So, we've been trying to remind ourselves what matters to us. Recently, we've often come back from work to look at family photos, images from the past and present, and photos of our wedding weekend last year, a weekend full of love. When things are getting weird, tough, frightening in the world, just to come back to ourselves and be reminded of the love we have surrounding us from friends, family, and each other can be so powerful. I want to cherish that more and more each day. Last week, I looked at all our wedding photos again, and it brought back all that happiness and love. I've been wanting to write a blog about it for a while, but now seems to be the right time, and we've had quite a few folk asking us to show our photos lately, so we thought we'd share them here, and tell you a little bit about our days - yes, we had 2!! Me and Suze have been together for quite a while now, and we wanted to wait until we could get married, in the same way as other couples. There were two venues near to Hebden Bridge that we absolutely loved, so we decided to incorporate them both into our celebrations, and spread this over the weekend. On the first day, we had the legal ceremony down at Gibson Mill surrounded by a small gathering of friends and family. In true West Yorkshire fashion, we had a lot of weather! We all walked through Hardcastle Crags to get to the venue. 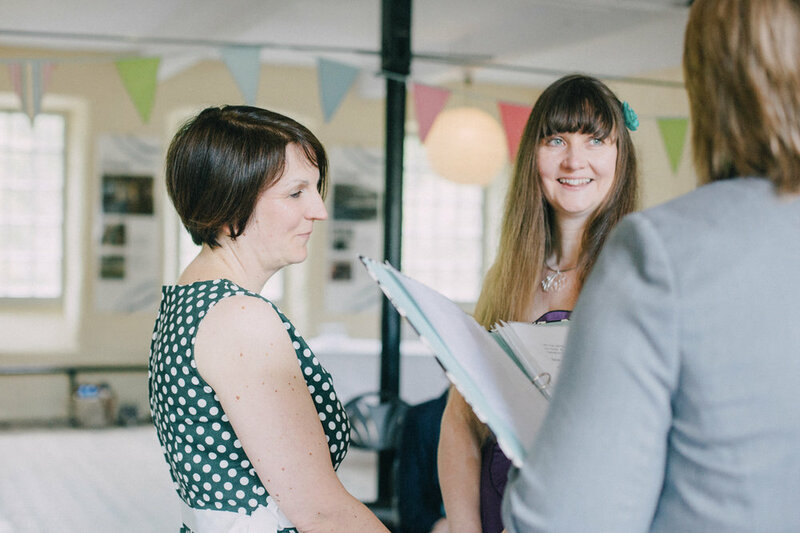 We had quite a few tears, and a few giggles too when Suzi nearly married the Registrar by saying her vows to her! I had asked Fiona from Firenza Floral Designs to create a headpiece for me and I think my description was 'I'd just like some moss and twigs or something!' She ran with it, and created a thing of beauty - I loved it. Debbie from Zeitgeist placed it in my hair very expertly! Meanwhile, my cousin Liz was with Suzi..
And then, a short walk through town to get the bus up to Wainsgate Chapel. It was a super way for us just to have a few chats with friends before the ceremony, and to take in the views. We asked the driver to take us onto the moors, so some of our friends from further afield could see the view from the tops! And then - to the ceremony. This was such an important part of it for us. We always wanted to do things our way, and writing our vows and tailoring this to fit who we are was a big thing for us. So when we met Jan from Celebration Ceremonies & Weddings for the first time and ate pancakes, we knew she was absolutely the right person. I've just read back through the ceremony and the readings, and I have just shed a little tear. Our friend Shilpa and my sister Katy read perfectly, we shared our vows, and our friends Hannah, Ffion & Euan sang beautifully. I don't think either of us had anticipated how nervous we were going to be, but we just kept holding hands tightly. And then we headed outside for dancing to Mr Wilson's, and some liquid refreshments! Hannah had worked so hard to titivate the old school room where we held the reception, of course with lots of lights! We loved the lanterns from The Hanging Lantern Company. It was such a treat to climb the stairs up to the room and see it all laid out, for a feast! And Fiona had created beautiful florals for the tables. After food (including cheese and cakes made by our friends), we said a few words, and then turned the room around for the evening's celebrations. A few weeks before the wedding, me and Suze were driving to a job. 'Dream A Little Dream' came on the radio, and Suze suggested we have the tune as part of our wedding playlist. I had a word with my friends Dave & Euan and we 'surprised' Suze with it at the beginning of the night. I say surprised as I have an inkling she may have heard us sound-checking! We always knew we wanted to book the amazing Me & Deboe for our wedding. In fact, we'd seen them at Wainsgate for the first time a few years previous. They are just super talented and absolutely got the party started with a mix of covers and their own fab tunes! After Me & Deboe, we had a short breather before the Ceilidh began. The wonderful King Cole. And after that, a wedding playlist with some of our favourite tunes, and songs people had added to it. Much more dancing ensued! Thanks to all our family and friends for their help and support both in the run up, on the day, and the days after. And here's a link to the wonderful suppliers we had on the day.